Here, nine terrific Middle Eastern recipes to make and get a jump on the trend. “At the beginning of the Iraq wars, I thought Middle Eastern food would be popular, as the military brings back food trends,” says Seattle chef Tom Douglas. “I’m interested in ingredients like Aleppo pepper and sumac. They’re popular now, but will be more so in five years.” Here, nine terrific Middle Eastern recipes to make and get a jump on the trend. This sweet and tangy Middle Eastern stew is made with falling-apart tender lamb. Rich and luscious sesame sauce is key to these quick Middle Eastern-flavored lettuce cups. This fantastic stew is a take on khoresht fesenjan, a classic Persian stew made with pomegranate juice and walnuts. Molokhia gets its name from a dark leafy green of the same name, which develops an okra-like viscosity when cooked. 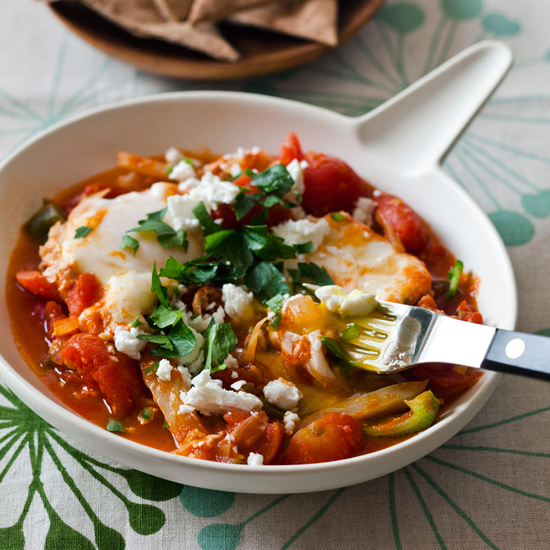 Often known in Italy as Eggs in Purgatory, this baked egg dish is perfect for any meal of the day. This hearty vegetarian stew is layered with eggplant, tomatoes, lentils, chopped onions and garlic. Shwarma, thin slices of roasted meat and condiments that are often wrapped in a pita, is a popular street food throughout the Middle East. Here, it’s made with simply grilled butterflied leg of lamb.